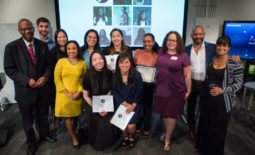 On June 18, the Asian American Journalists Association Seattle chapter awarded five promising young men and women scholarships to recognize their talent and encourage their journalism aspirations. AAJA Seattle has been building a pipeline of minority journalists through the Northwest Journalists of Color program since 1986. 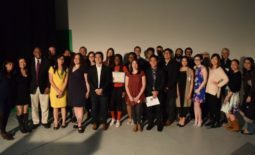 More than 100 scholarships have been awarded. Previous winners have gone on to work for The Seattle Times, The Los Angeles Times, The Associated Press, CBS News and many, many more news organizations. The Seattle Times hosted the reception in its auditorium, and sports columnist Jerry Brewer gave a heartfelt speech that inspired and moved us all. Left to right: KING 5 anchor Lori Matsukawa, Mary Jean Spadafora, Seattle Times columnist Jerry Brewer, Tom Giratikanon's father, Peter Sessum, Michelle Ericksen, Olivia Hernandez. Congratulations to this year’s NJC winners! Tom Giratikanon, 21, is a senior at Northwestern University, where he is majoring in journalism. If thereâ€™s one running theme in Tomâ€™s journalism pursuits, itâ€™s blazing his own trail. At Edmonds-Woodway High School, he started The Prophet, an alternative student newspaper, and in college, he founded an award-winning daily online news site, North by Northwestern, that rivals the daily student newspaper. Heâ€™s now the lead web developer and designer for Abroad View magazine, a national magazine about study abroad. One of his professors writes, â€œI have no doubt that his commitment to ethics, high skill set and entrepreneurial spirit will allow him to be a journalist who makes a strong mark on the industry in the future.â€ Tom is a 2005 recipient of the NJC scholarship. Mary Jean Spadafora, 18, starts college this fall at the University of Washington, where she plans to major in communications. Mary graduated from Kentridge High School, where she wrote for its Fleet Street News. A Cherokee by birth, Mary says that she wants to make the news more interesting for teens and young adults without sacrificing objectivity and good writing. Her journalism teacher writes, â€œWhether through a carefully wrought piece of analysis or a straightforward inverted pyramid news piece, she crafts, edits, reconsiders, and rewrites. Too often do students think one draft is sufficient. Mary Jean is not a typical student.â€ Mary also has volunteered in a nursing home and the Ronald McDonald House and was a member of her high schoolâ€™s band and varsity cheer squad.